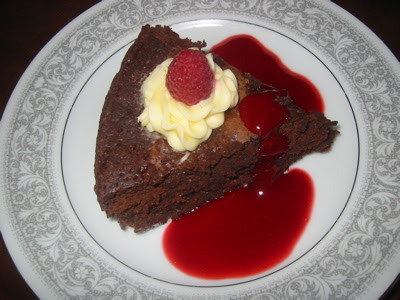 I tried to make flourless chocolate cake several times, finally I made one that fit my taste. 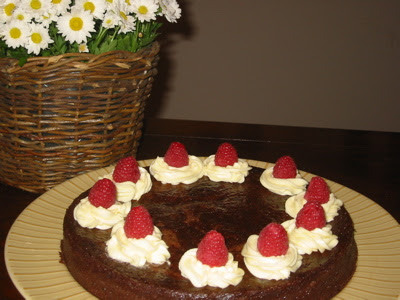 Since then this cake and its friend: the raspberry coulis, are always a big hit. Enjoy! Boil water in a kettle for water bath. Grease a 9-inch springform pan with 1/2 tbsp butter. Line bottom with a parchment paper. Cover pan underneath and along sides with 3 layers of foil and set in a roasting pan. Boil water in a medium saucepan. Combine the chocolate and butter in the top of a double boiler or in a bowl set over simmering water. Stirring constantly until smooth. Cool it. Add the orange juice and stir it until just blend. Set aside. Meanwhile combine eggs, sugar, vanilla, and salt in a large bowl and mix with electric mixer until frothy and almost doubled in volume, about 5-10 minutes. Using a rubber spatula, fold 1/3 of egg mixture into chocolate mixture. Repeat this process until all of egg mixture has been folded into chocolate mixture. Pour the batter into prepared springform pan and place in the roasting pan. Pour enough boiling water into the roasting pan to come about halfway up the sides (water bath). Bake until cake has risen slightly and edges are just beginning to set about 35-40 minute. Remove cake from roasting pan and cool on wire rack. Remove foil, cover, and refrigerate overnight. Remove cake from refrigerator. Remove springform pan sides, cover the cake with plastic wrap, and invert cake onto flat surface, and peel away parchment paper from bottom. Reinvert cake on a large plate. Put the frosting in a pastry bag fitted with a star tip and pipe straight down onto the cake, release pressure and make a circular motion with your hand. Put on top of every icing with a fresh raspberry. Have fun and be creative with your design! When you ready to serve, slice into wedges and drizzle it with raspberry coulis. Yum!